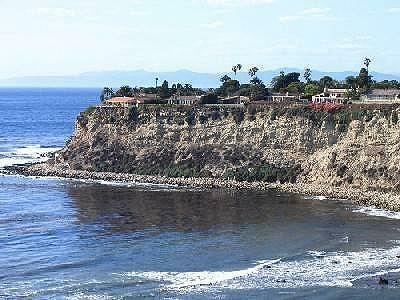 Bluff Cove is a wide, sweeping bay surf spot in Palos Verdes…. Bluff Cove is a wide, sweeping bay surf spot in Palos Verdes. Located at Palos Verdes Drive West and Via Monte Mar, the Cove was popular with the redwood paddleboard crew of the 1930s. Also a marine preserve, it offers a rugged element unique to the L.A. surfing experience. Home to porpoises, seals, and sea otters the area generally keeps healthy kelp beds and wind chop to a minimum. The bulge of the Palos Verdes Peninsula blocks all but west and northwest swells creating usually small swells during this summer but several consistent winter breaks. The Cove has three main breaks- Little Reef (up to six feet on a medium to high tide), Middle’s (the main break with up to 12 feet), and Boneyard’s (scattered series of reeds at south end that break erratically, up to 15 feet). Going home in Sept, sis can I borrow your drysuit? Also I just emailed this and a photo of the Pt. Fermin lighthouse to Rachael with no words, she’ll know what I mean.